It is a work in Progress. Hope to improve it every chance I get. 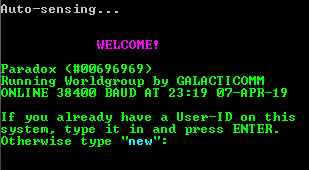 The original Gate BBS serving the online BBS community since 1980. Home of ACnet (Advanced Communications Network). The Gate BBS serving the online BBS community since 1980. DOVEnet, FidoNet. Inter BBS gaming and more. My old VBBS board the first software I started out with. Ah the memories. Many updates, lots of Doors and working on the RIP screen now!